Wherever you are in the world, sat navs can get you from A-to-B quickly and efficiently. Whether you’re driving at home or abroad, for work or for pleasure, there’s a sat nav deal to take the stress out of driving. Compact, lightweight and portable, these devices can easily be moved from one car to another. They can direct you along the quickest route to your destination – simply enter the postcode or place name, or browse by POI (Points of Interest). Ideal for driving on unfamiliar roads, GPS sat navs use live traffic updates that can help you to avoid traffic jams and road closures. Satellite navigation offers a range of features to make driving easier. Using Global Positioning Satellites (GPS), sat nav devices can warn you of upcoming toll roads, hazards and speed cameras, and can offer lane guidance to help you stay in the right lane at junctions. 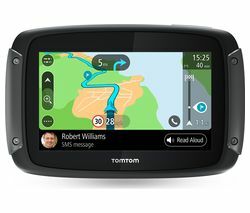 Our range, including Garmin and TomTom sat nav systems, lets you choose from simple UK-only map models to extensive mapping to help you get on the road wherever you go. There’s also a range of useful sat nav accessories to make using them easy. Take a look at our Black Friday sale to save on your Sat Nav.